The Codeology m200 base unit is a stainless steel base that allows you to upgrade the Alpha Dot Midjet range and Domino C7, C16 and C34 range of ink jet printers to a 5 litre ink supply. Replace the 1 litre bottles and piercing probes with a simple screw-on bottle top - removes the chances of blocking the piercing probes. Have less frequent waste disposal requirements for one 5 litre bottle over five smaller bottles. 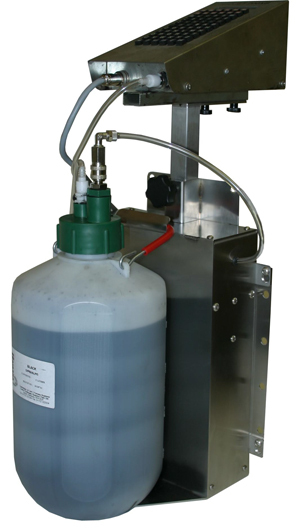 Changing over your existing Midjet 1 or 3 litre base to the Codeology m200 5 litre base is simple. The mounting plate has the same fixing centres as the Midjet base and the mounting bracket fits the existing Midjet head upright slide bar. The base includes its own integral air pump, power cable and ink lines with the Midjet connectors already fitted. Simply unplug the Midjet power supply and ink line from your Midjet, remove the base and replace with the m200.